The term drought is not easy to define. The easiest way to explain a drought is a period of unexpected rainfall deficit which results in a shortage of water. Drought hazards develop slowly, there are no clear beginning or end and can affect extensive areas. The impacts of drought vary from lack of adequate drinking water, loss of vegetation, loss of farmland, loss of livestock and loss of life due to famine or dehydration. This is a complex issue which is difficult to define. Drought is not caused by low rainfall amounts but the lack of 'expected' rainfall. People in different regions adapt to the different rainfall levels that occur in that area. When these are reduced, this is when a drought hazard may be created. The extent of drought is dependant on region type (semi-arid, temperate etc) as drought tends to be longer in drier areas. The impact of droughts depends on climatic conditions at the time (high pressure systems, El Nino) and the national wealth of the area involved. Developing countries tend to be more affected by droughts as much of the income is from subsistence farming which is greatly affected by a lack of water. Drought can also be affected by deforestation as vegetation help contain water in an area, when the vegetation is removed the soil does not retain water as well. Drought can develop practically anywhere in the world, unlike earthquakes or severe storms there are no specific regions which are affected. 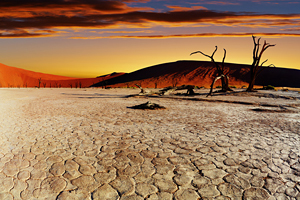 Drought can extend over extensive areas causing widespread destruction to crops and water levels. The seven year drought struck Sahel in sub-Saharan Africa between 1968 and 1975. Between eighty and ninety percent of the people in this area depend on subsistence farming to live. By 1970 nearly 3 million people had been displaced and were in need of food aid, by 1972, international was used to feed over 50 million people. The drought resulted in the economic collapse of Mauritania, Senegal, Mali, Niger, Chad, Sudan, Ethiopia and Somalia. These droughts lead to widespread famine in Ethiopia and Sudan. An estimated 450,000 people died during the famine which developed due to lack of water for irrigation.